Part 1 Processing: Breeding and quality; Husbandry techniques; Stunning and slaughter; Secondary processing; Processing of turkey, geese, ducks and game birds; Packaging. Part 2 Safety and quality: Shelf life and spoilage; Refrigeration; Other preservation techniques; Controlling microbial hazards; Chemical residues; Treatment and disposal of processing waste; Maintaining meat quality during processing; Measuring quality parameters; Managing safety and quality. Poultry products are universally popular and in recent years the consumption of poultry meat has risen dramatically. To ensure the continued growth and competitiveness of this industry, it is essential that poultry meat quality and safety are maintained during production and processing. This important collection provides an authoritative review of the key issues affecting poultry meat quality in production and processing. The book begins by establishing consumer requirements for meat quality, before examining the influence of breeding and husbandry, and techniques for stunning and slaughter of poultry. Chapters 5 and 6 look at primary and secondary processing and Chapters 7, 8 and 9 discuss packaging, refrigeration and other preservation techniques. There are also chapters on microbial hazards and chemical residues in poultry. Quality management issues are reviewed in the final group of chapters, including shelf-life and spoilage, measuring quality parameters and ways of maintaining safety and maximising quality. 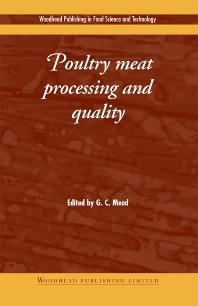 Poultry meat processing and quality is an essential reference book for technical managers in the Poultry Industry and anyone engaged in teaching or research on poultry meat production. Technical managers in the Poultry Industry and anyone engaged in teaching or research on poultry meat production. Professor Geoffrey Mead was formerly at the Royal Veterinary College, University of London. Now a consultant, he has an international reputation for his work on the microbial safety and quality of poultry meat.